Is it me or is this completely unconvincing???! 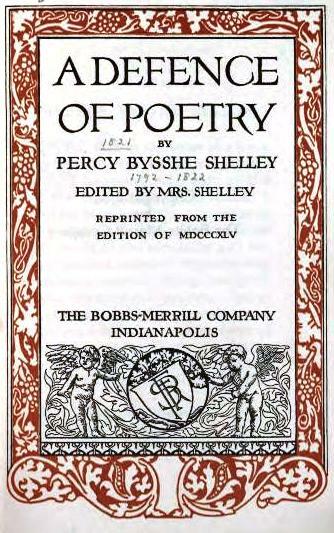 Shelley extends the definition of poetry in order to include all arts (even music, painting etc). This is no poetry, this is arts in general! He then distincts poetry and believes it superior to all other arts and sciences and the major (only?) force to influence societies…how can this be? A musician or a painter need not read a single verse to be great in their art and influence society with their works, let alone a scientist. He also considers people like Plato, Locke, Hume, Voltaire, Rousseau as poets. Painters like Rafael and Michelangelo. Historians too. Those are, strictly, political philosophers, painters and historians. They are no poets! Their contributions cannot be linked back to poetry. I don’t think someone can argue for the value of poetry in a society (as is the book’s purpose) by making such broad assumptions. Otherwise it’s a great read, only it should be titled differently. A Defence of Arts, yes. A Defence of Great Minds, yes. A Defence of Poetry, no.